While customer experience is a key business driver for any company, few have yet to understand that, in the digital age, when customers can instantly access swathes of information about a company and its competitors, it has become fundamental to obtaining a real, sustainable, competitive advantage in a rapidly changing marketplace. With customer expectations becoming much more demanding, it is essential for any business to think with the customer at the centre when making any business decision. To help make your digital strategy more customer-centric we recommend these 6 requirements for a digital strategy development process. A digital strategy should start off with a clear understanding of who the audience is. Building personas and segments into the programme ensures your content will be relevant to the customer. Your digital strategy needs to be informed by a shared understanding of who your customers are, how they perceive the interactions they’re having with your company today, and what they want and need from your company in the future. This is all about getting customer feedback on your company as they experience it now, and what they want and need in the future. 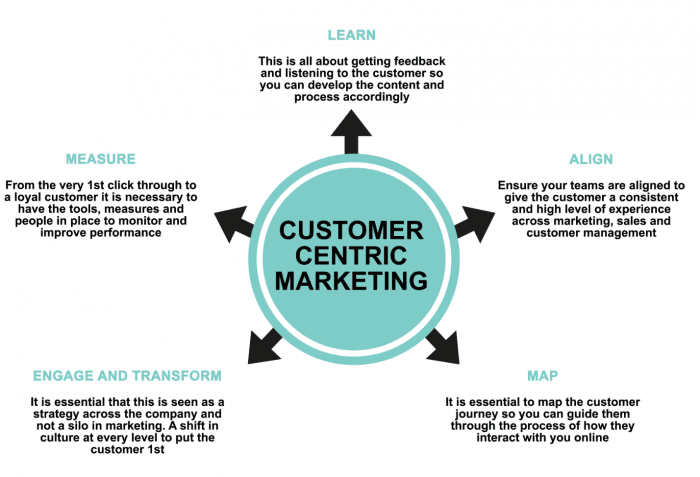 Listening to the customer allows you to develop the content and process accordingly. Teams must be aligned to give the customer a consistently high standard across all departments, from marketing to sales and customer management. This is known as a “single customer view” and is especially important in the digital age with numerous channels of communication available. To achieve a single customer view, it is vital to use the tools now available to map each customer journey throughout the customer lifecycle. This will allow you to understand how to best guide each customer through the process of interacting with your brand online. It is essential that your strategy is actually a company-wide strategy, and not simply a silo in marketing. A conscious culture shift needs to take place at every level, to reach a point where the customer is central to all aspects of the business. Data can be used to ensure that everything from the customer’s first click, through to becoming a loyal customer, is carefully and usefully analysed, with all the necessary tools, measures and people in place to monitor and ultimately improve performance. Voice of the Customer Data is important to getting opinions and feedback too. Changing the way you do business to make your digital strategy truly customer-centric is no simple task, requiring a shift in priorities and careful planning. But it will undoubtedly pay off, giving you that competitive edge to reap dividends many times over for the foreseeable future. Running a strategy workshop is an excellent way to take the initial practical steps in building a customer-centric digital strategy. First, find out how to plan your digital marketing strategy to engage with your audience throughout the customer lifecycle by attending our planning webinar. Thanks to Mark Donkin for sharing his advice and opinions in this post. Mark is Managing Director at of SuccessFlow. SuccessFlow are Content Partners of Smart Insights. You can follow SuccessFlow on Twitter or connect with Mark on LinkedIn.